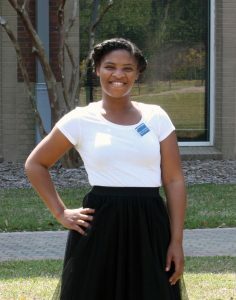 Senior middle grades education major Kamaren Walthour is a full-time undergraduate student, mother of two, wife, devoted member of her church, and most recently, the founder of a program called Pop-Up and Read. A free resource for parents and students in Liberty County, Pop-Up and Read provides a group learning environment for the enhancement of literacy among children ages 3 to 10. Each program session begins with an interactive story. Students then break out into workstations of their choice including reading, writing, science and two craft tables. While students work in small groups at the stations, Walthour works with students individually to focus on their area of greatest need. Parents are also required to stay and participate in the educational activities. “I have learned in my classes that parental involvement increases academic success,” said Walthour. During a parent-teacher conference for her four-year-old daughter, Walthour said she was told that her daughter was behind on knowing her letters and numbers and recalling stories. This gave Walthour the push she needed to move forward with a project she had been debating for nearly a year. Using knowledge that the middle grades education program has provided her, Walthour created Pop-Up and Read to benefit not only her daughters but the entire community as well. With the assistance of her aunt, Angie Walthour, who is certified in early childhood education, Walthour is constantly thinking of ways to expand and improve her program. “It’s disheartening how many of our children struggle with reading in middle and high school,” said Walthour. “That’s what made me want to get involved in my community in the first place. I substituted in the middle schools and high schools in Liberty County and saw how many children do not know how to read or are struggling to read and don’t have any type of strategies to be able to comprehend what they are reading. Walthour says her College of Education professors have been very supportive. Pop-Up and Read is held every other Thursday from 5 to 6:30 p.m. at the Stafford Pavilion in Liberty County. Following the sessions, Walthour follows up with newsletters that include additional resources and activities to strengthen reading skills.